Luckily, if you disagree with him, you can start a mutiny and become the next captain yourself! 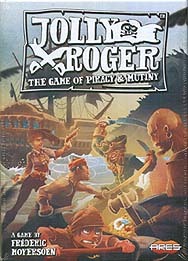 Jolly Roger is a card game of pillage, plunder, and mutinies for 4 to 10 pirates. Every turn, the Captain chooses a destination for the ship. During an attack, players will (more or less!) cooperate, playing crew cards to win the battle and take the prize. Treasure is divided between all the pirates, but your gold is never secure until you bury it at Treasure Island. Unrest is always brewing...And when mutiny begins, you'll need to decide whose side you stand for. Fast, rowdy, and easy to learn, Jolly Roger is equally fun for casual players and veterans of a thousand boardings.